FILE - Pakistani-made NASR missiles are on display during a military parade to mark Pakistan's Republic Day, in Islamabad, Pakistan, March 23, 2017. Pakistan has criticized as "extremely unfortunate" a new U.S. report labeling the south Asian country's weapons a continued threat to regional American interests. The annual global threat assessment notes that Pakistan continues to produce and develop new types of nuclear weapons, including short-range tactical weapons, sea-based cruise missiles, and longer-range ballistic missiles. "These new types of nuclear weapons will introduce new risks for escalation dynamics and security in the region," said the report, which has been sent to a congressional committee for review. 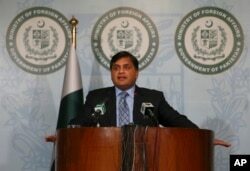 Foreign Ministry spokesman Mohammad Faisal criticized the report Thursday for its "singular negative focus" on Pakistan. FILE - Pakistan's Foreign Ministry spokesman Mohammad Faisal briefs journalists in Islamabad, Pakistan, Feb. 4, 2018. He told a weekly news conference in Islamabad that "any credible threat assessment" would have cautioned about what Pakistan alleges are India's "fastest growing" stockpiles of nuclear weapons. "We have consistently maintained that Pakistan's nuclear posture is purely defensive, in order to deter the aggressive designs of its hostile neighbor in the east," Faisal said in a direct reference to rival India. The U.S. report "smacks of partisanship," he concluded. Washington is particularly worried about Islamabad's short-range small nuclear weapons because U.S. officials believe their introduction into the Pakistani army's arsenal has increased chances of nuclear conflict in the region. Pakistani officials maintain the nation's short-range battlefield NASR (Hatf-IX) nuclear-capable missile would deter bigger neighbor India from imposing a sudden, limited assault with conventional forces under New Delhi's "Cold Start" doctrine. The military announced last year it had enhanced NASR's flight maneuverability and extended its range to 70 kilometers from 60. India and Pakistan have fought three wars and the two nuclear-armed nations remain locked in routine military skirmishes along their de facto border in the disputed Kashmir region known as the Line of Control. On Thursday, Pakistan's army alleged Indian fire from across the Kashmir frontier hit a school van, killing the driver and forcing residents to flee. There has been no comment from India. The U.S. intelligence assessment report has also warned of escalating tension in the event of a major terrorist attack in India or an increase in violence on the Kashmir Line of Control. Pakistan's fragile relations with the U.S. have deteriorated lately over allegations Islamabad covertly maintains ties with the Taliban and other militant groups fighting American forces in Afghanistan. Pakistani authorities deny any links with the militants.